This sample resume shows how health information technicians can record their medical coding expertise. Need to record your medical coding expertise on your resume for your next job in health information technology? 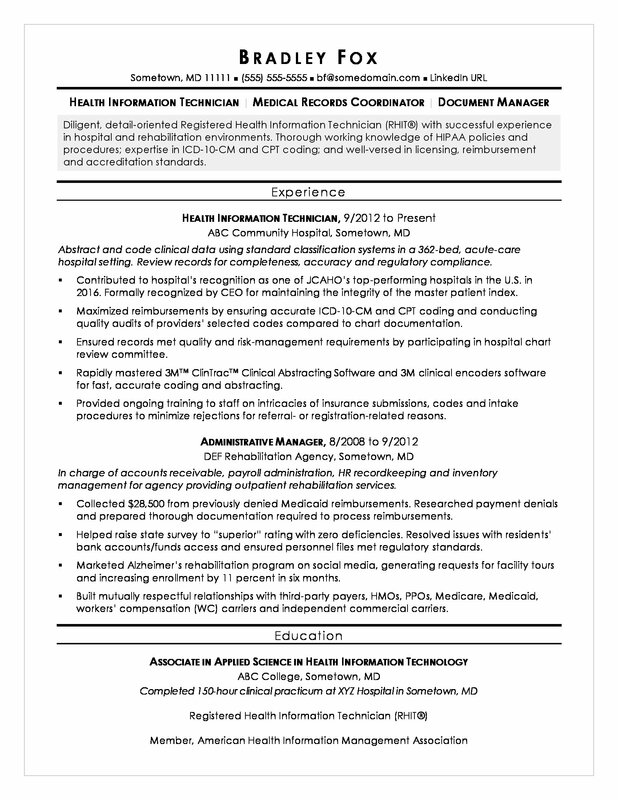 View the sample resume below, and download the health information technician resume template in Word. And if you need more help, get a free resume evaluation from the experts at Monster's Resume Writing Service. Jobs for health information technicians are projected to grow by 13% (or 27,800 jobs) from 2016 through 2026, which is faster than average, according to the Bureau of Labor Statistics (BLS). You'll find the highest level of employment for this job in the following states: California, Texas, Florida, New York, and Ohio; and in the following metropolitan areas: Los Angeles, New York City, Chicago, Phoenix, and Houston. As a health information technician, you can expect to earn a median wage of $39,180 per year, or $18.83 per hour, according to the BLS. Additionally, you can learn more about information technology careers and search for medical coding jobs on Monster. Diligent, detail-oriented Registered Health Information Technician (RHIT®) with successful experience in hospital and rehabilitation environments. Thorough working knowledge of HIPAA policies and procedures; expertise in ICD-10-CM and CPT coding; and well-versed in licensing, reimbursement and accreditation standards. Abstract and code clinical data using standard classification systems in a 362-bed, acute-care hospital setting. Review records for completeness, accuracy and regulatory compliance. Contributed to hospital’s recognition as one of JCAHO’s top-performing hospitals in the U.S. in 2016. Formally recognized by CEO for maintaining the integrity of the master patient index. Maximized reimbursements by ensuring accurate ICD-10-CM and CPT coding and conducting quality audits of providers’ selected codes compared to chart documentation. Ensured records met quality and risk-management requirements by participating in hospital chart review committee. Rapidly mastered 3M™ ClinTrac™ Clinical Abstracting Software and 3M clinical encoders software for fast, accurate coding and abstracting. Provided ongoing training to staff on intricacies of insurance submissions, codes and intake procedures to minimize rejections for referral- or registration-related reasons. In charge of accounts receivable, payroll administration, HR recordkeeping and inventory management for agency providing outpatient rehabilitation services. Collected $28,500 from previously denied Medicaid reimbursements. Researched payment denials and prepared thorough documentation required to process reimbursements. Helped raise state survey to “superior” rating with zero deficiencies. Resolved issues with residents’ bank accounts/funds access and ensured personnel files met regulatory standards. Marketed Alzheimer’s rehabilitation program on social media, generating requests for facility tours and increasing enrollment by 11 percent in six months. Built mutually respectful relationships with third-party payers, HMOs, PPOs, Medicare, Medicaid, workers’ compensation (WC) carriers and independent commercial carriers.